Tired of your drying dishes blowing off the table and into the sand? 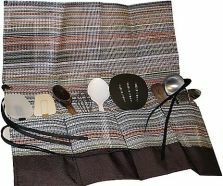 These mesh bags strap under the table with a separate pocket for silverware and one for utensils. Available in Black, Blue, Red, Yellow and MultiMesh. A must for your river camp kitchen. It keeps your utensils clean and in one place. Roll it up and away you go! Small - 24" x 15"
Large - 36" x 12"
Say good-bye to rusty knives at the bottom of a bucket or ammo can. A smarter and safer way of organizing and storing the sharp cutlery in your camp kitchen while on the river, our ballistic nylon roll up bag for your camp kitchen not only organizes your cutlery, it keeps your hands safe! 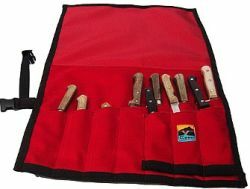 Featuring 10 pockets for housing an array of sharp knives, it rolls up neatly and closes into a tight bundle. Fit all of your toiletry needs into this little mesh bag. 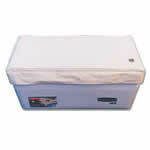 Conveniently fits into ammo can and its mesh fabric aids quick drying. Also available in oxford. For those extended hot weather trips (when your lettuce won't last) we make a light mesh drawstring bag to grow your own sprouts refreshing sprouts for salads and sandwiches. For easy serving of "box" wine, we have made these nylon bags with a webbing loop. Remove wine from the box and insert. 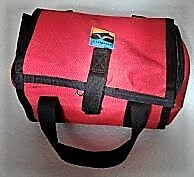 This is a great bag for a guides gear and for extra items a trip may need like a Wonder Pump. Exactly what any rafter needs to keep those beers and sodas cool while hanging off the boat. Made of the same long lasting mesh, with a heavy 1" webbing loop to allow clipping onto your boat (carabiner not included). Rope and grommet closure prevents your gear from escaping. Comes in: Blue, Red, Yellow or MultiMesh. Reg: 17" x 22" Lg: 25" x 30"
These are just the item to keep all those rigging straps together. 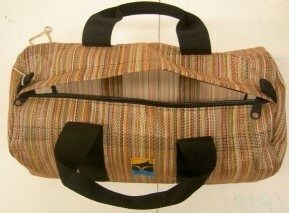 A great bag for a guide's gear, these are made of heavy duty vinyl coated nylon mesh. 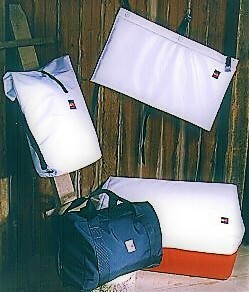 These bags are not only durable but allow wet gear to dry. Double stitched and seam taped, with a heavy YKK #10 zipper, they also feature 2" webbing that encircles the bag for added strength. 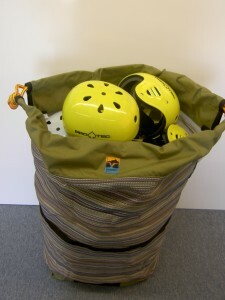 S: 10" x 18" M: 12" x 24"
L: 15" x 30" XL: 15" x 36"
PFD / Helmet Bags - A must for every outpost! 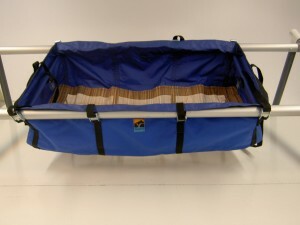 The perfect bag to keep those PFD's free from the wear and tear and general abuse they can receive in transport. 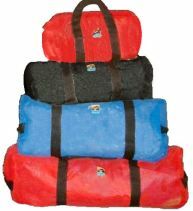 These bags feature a heavy duty 100 denier ballistic nylon bottom, durable body and rope/grommet closure at the top. A carry handle is provided and 1" webbing on bottom for tying onto your load. The mini bag holds about 10 Type V PFD's, the regular size bag holds approximately 20 Type V PFD's, the large holds about 30 and the X-large about 36. These are the perfect solution for an extended rowing frame in that they replace cross thwart space with a roomy stowage compartment. Constructed of bombproof vinyl mesh & sturdy cordura - yellow or gray. 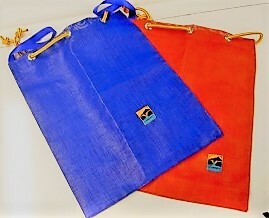 These bags come in four standard sizes or custom made to fit any frame. Contact http://www.pacificriversupply.com or Call 510-223-3675 for Custom information. 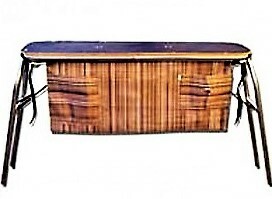 S: 14" x 24" x 40" M: 14" x 24" x 44"
L: 14" x 24" x 48" XL: 16" x 24" x 52"
Designed especially for the hot climate of Grand Canyon. These tough covers not only provide a comfortable seat and protect your cooler, but help to further insulate your cooler on those hot days. Made of strong 18 oz. PVC coated fabric and filled with 1" polyethylene foam. Perimeter skirt is 4" long. These covers are a must on any professional rig. A mesh bottom enables foam to dry and a closure allows removal or replacement of foam. Sizes to fit all coolers. Contact http://www.pacificriversupply.com or Call 510-223-3675 for Custom information. Similar to our cooler cover, these pads provide a comfy seat for your passengers and attach with three straps and Ancra cams. Designed to insulate and protect your drink coolers, these foam lined PVC fabric bags fit standard 2, 3 and 5 gallon sizes. 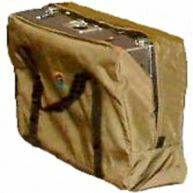 We also make a variety of ballistic nylon bags customized to fit your stoves, fire pans or any other items. Contact http://www.pacificriversupply.com or Call 510-223-3675 for Custom information. Double stitched for long lasting quality! Our heavy duty mesh fabric drains so your rope will dry and last much longer. have cordura bottoms and mesh sides. 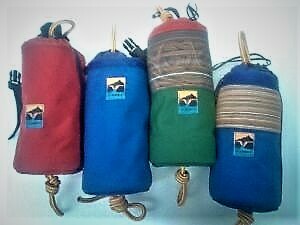 For better second throws 1/2 and 1/2 Rescue Bags have cordura bottoms and half way up which holds enough water to make the second throw quicker and easier. Store upside down and the mesh top lets moisture drain. ****Can be custom embroidered with your company logo/name or your personal name. Solid Cordura Rescue Bags are bomb proof for when that second throw is critical. ****Can be custom embroidered with your company logo/name or your personal name. **All styles are available with or without the 3/8" rope. 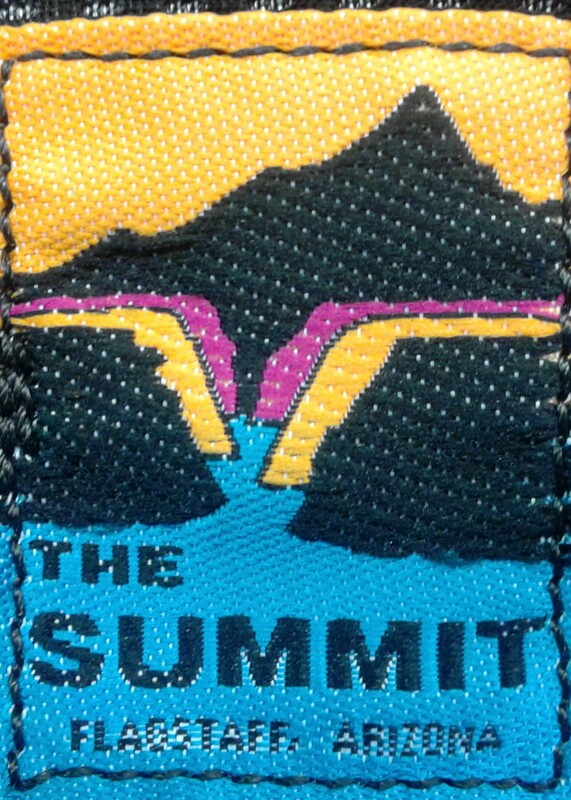 Summit Mini Rescue Bags feature 1/4" diameter rope and are available as an All Mesh Mini or 1/2 and 1/2 Mini. NEED A PRODUCT NOT LISTED? CALL FOR CUSTOM WORK! Content copyright . Pacific River Supply. All rights reserved.